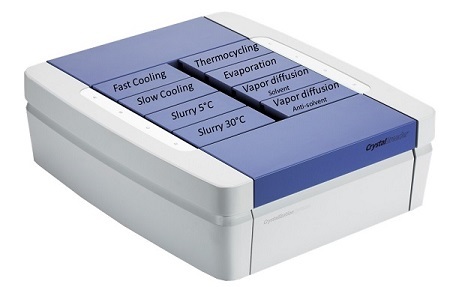 The Crystal16® has been designed for medium-throughput crystallization studies. The tool can be used for a range of experiments such as metastable zone width determination, single-crystal generation for structure determination and solubility measurements. The Crystal16® has also been successfully used in other application areas such as polymer solubility studies and process chemistry. Automating the execution of crystallization experiments means more experiments can be carried out in the same timeframe, but also, the results are much more reproducible and controllable, which is essential for good science and answering the requirements put forward by the regulatory authorities. A typical polymorph screening project of 96 experiments would be run using, for example, 2 different concentrations of the API in 8 solvents and 4 solvent mixtures, applying 2 different cooling profiles (e.g. a fast and a slow cooling rate of 5 °C/min. and 0.1 °C/min. respectively) in combination with 2 ripening times (short ripening to capture unstable or kinetically stabilized forms and long ripening to allow more stable forms to appear). Using the Crystal16®, 96 experiments could be run in less than 1 week using only a few grams of sample. A salt screening study could be designed for instance from 4 solvents combined with 8 different counter ions (acids or bases). Given a cooling profile and ripening time and using 2 different concentrations for each solvent, the total number of experiments would again be 64. Run on a Crystal16® the salt screening study would be completed in approximately 0.5 week.